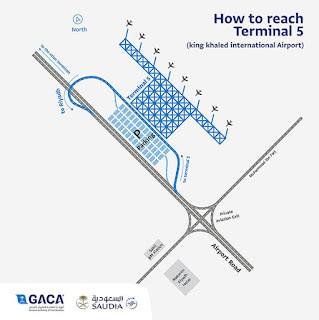 SAUDIA DOMESTIC FLIGHTS : Saudi Arabian Airlines in Riyadh shifted all of its domestic flights operation From Riyadh and To Riyadh is now from Terminal 5 (Earlier its Terminal 3) of King Khaled International Airport (KKIA). FLYNAS DOMESTIC FLIGHTS : From the 13th August all flynas domestic flights TO and FROM RIYADH will be from terminal 5(five) of King Khalid International Airport. - It is little near to International airport, Every 10 minutes their is a shuttle bus service between terminal 5 and international terminals.